We aimed to clarify whether the coronal alignment after medial unicompartmental knee arthroplasty (UKA) is predictable using preoperative full-length valgus stress radiography. Thirty-seven consecutive patients with a mean age of 71.5 ± 7.0 years awaiting medial UKA were recruited. Full-length weight-bearing radiographs of the lower limbs were obtained pre- and postoperatively. Preoperative full-length valgus stress radiography in the supine position was also performed, and the transition of the hip-knee-ankle angle (HKAA) and the weight-bearing ratio were assessed. The tibia first cut technique was used, and the distal femur was cut parallel to the cutting surface of the proximal tibia during surgery. The mean postoperative HKAA was 2.0° ± 2.1° varus, and the mean weight-bearing ratio was 43.1 ± 7.7 %; each of these parameters demonstrated significantly strong correlations with the values on the preoperative valgus stress radiographs (p < 0.01), while the correlation between the postoperative alignment and the preoperative standing alignment without stress was moderate (p < 0.01). The postoperative alignment was slightly undercorrected compared to that observed on the valgus stress radiographs (p < 0.05), and no knees exhibited evident overcorrection compared to that on the valgus stress radiographs. Preoperative valgus stress radiography is useful for evaluating the correctability of varus deformities and predicting the postoperative coronal alignment. 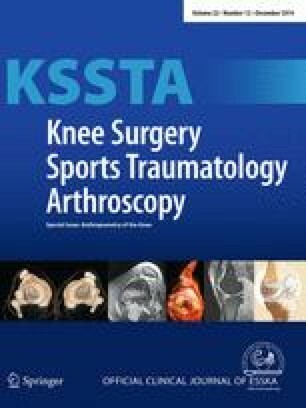 For clinical relevance, performing preoperative valgus stress radiography would help to more precisely select patients and, when combined with the tibia first cut technique, aid in achieving the expected knee alignment and avoid severe undercorrection or overcorrection. This study was supported by JSPS Kakenhi Grant No. 26861197.